If you haven’t seen this yet: you need to. 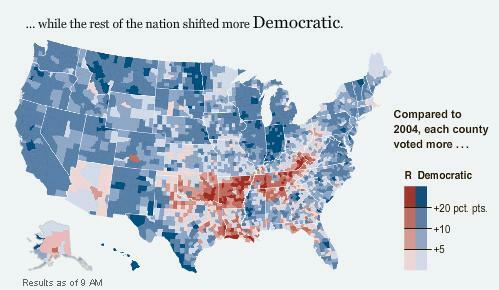 That’s a trend that no Republican should like to see, but no Republican should be surprised by. This isn’t a Center-Right country, or Center-left. It’s a country filled with people who need government to get work done. For the past two years, Democrats have done a better jog than Republicans is explaining their message, and what they want to do. Republicans are just name-calling. This is really the opposite of what the parties did from about 1994 until 2006. Republicans, starting with the Contract for America laid out their ideas better, and Democrats just said "we’re against that!" And dems got their asses handed to them. But now, with the core failure of Republican Rule, and purge of anyone from the Republican party who wants them to change, the Republicans are running on empty. Add to that a well laid out plan from the Democrats, and the electorate follows. Unless Republicans change, they are going to be America’s Tories for the foreseeable future. I suspect we will get several more months of infighting over tactics and appearances, and more purges of those who wish to engage in a debate over the party’s direction. It isn’t just that many of the folks leading the purge disagree with George Will and Peggy Noonan and Daniel Larison and Sullivan and Ron Paul about the direction of the future GOP- they want them destroyed for suggesting there needs to be a debate. That is how dead the party is, and Henke is right. They need some time in the wilderness, to figure out who they are and what they believe in and why and how it will be better for the country. Instead, I suspect we will see Palin pom poms and purity purges, which is all the more humorous given the defections from prominent conservatives to Obama, they are already whittled down to the true belivers. Next Post What are we gonna use, harsh language?